With Easter just around the corner, I’ve been busy creating some new recipes for you. How do Chocolate Coated Marshmallows sound and I have four different Hot Cross Bun recipes, there has to be at least one you will fall in love with. I’ve also included my Strawberry Creme Easter Eggs, Raspberry Chocolates, Chocolate Bark and Roasted Pecan Fudge for those that aren’t chocolate lovers. By making your own Easter treats you skip the additives and preservatives that are found in most commercially made sweet treats and buns. 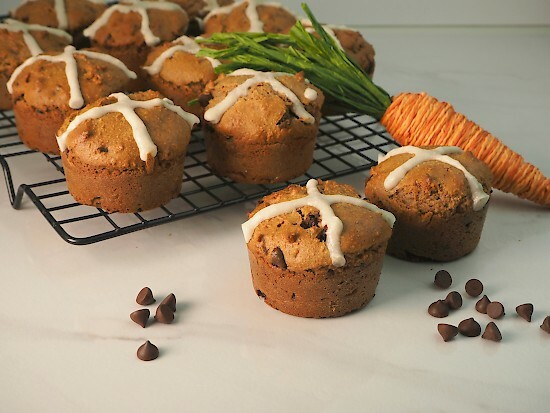 Of course, Easter means much more than marshmallow treats, hot cross buns, eggs and chocolate, but I have nothing against a few healthy treats and some fun to go alongside the traditional reason for celebrating Easter. My homemade marshmallows are simple to make and are made with real ingredients that are actually good for you. You won’t find any high fructose corn syrup, titanium dioxide or artificial flavours hidden in these yummy marshmallows. I based this recipe on the homemade version I made for my sons when they were young, but in those days I used glucose or corn syrup (oh, yuck!). The sweeteners in the marshmallow prevent them from breaking down, this recipe has natural sweeteners and much less than I used in the past, but I’m happy to say they are holding up well. (Not a chocolate lover? Just serve without dipping in chocolate). 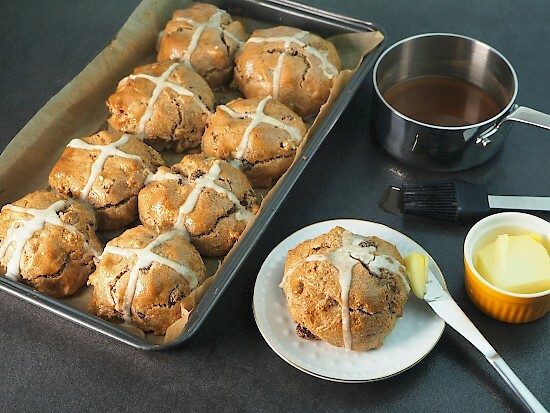 Hot Cross Buns – Hot Cross Buns have always been a tradition at Easter time in our home but the muffin style I usually made wasn’t popular with my hubby. He wanted them to look like real buns but still be healthy, flavoursome and grain-free. The addition of psyllium husk powder to the recipe has helped make the mixture hold together well to shape into buns, plus a couple of other tweaks. Sometimes it’s not always good that he likes a recipe this much, they just don’t last but I’m glad they freeze well to hide. 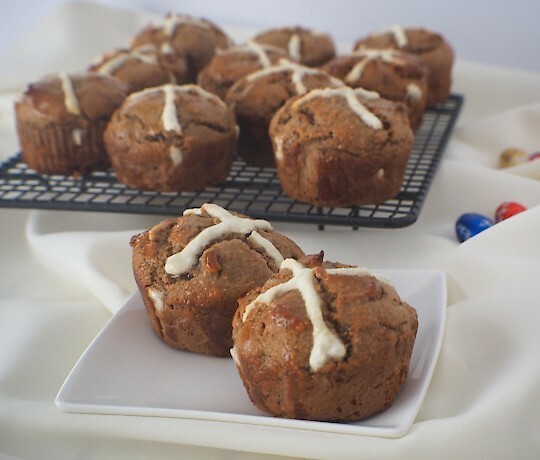 Nut-Free Hot Cross Buns – Next is my nut-free Hot Cross Buns – Most gluten-free/paleo versions of Hot Cross Buns have a cake texture. I’m delighted to say that this recipe has a more bread-like texture with the bonus of being nut-free. 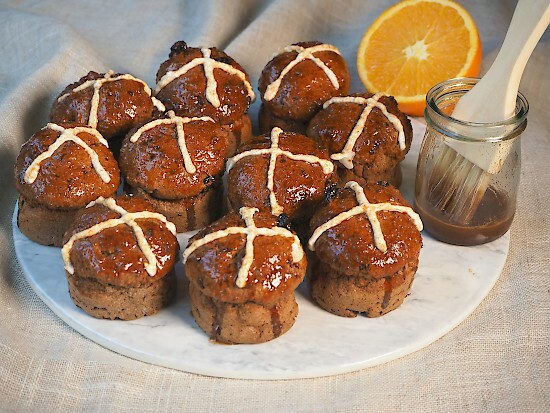 These traditional Easter Buns are spiced with cinnamon and allspice, then glazed to add a beautiful shine to the tops. Hot Cross Muffin-Buns – You also have another choice of buns. This is my original grain-free Hot Cross Bun/muffin recipe, it’s made with delicious moist almond meal/flour and the traditional sultanas. This is a quick recipe that cooks well in muffin tins. Choc Chip Hot Cross Muffins – I know you have seen the chocolate version in supermarkets, I couldn’t let you miss out. Here are my healthy Choc Chip Hot Cross muffins, they are delicious with their lovely soft texture. The dark chocolate chips and cinnamon give a yummy sweet flavour that you will find hard to resist. Strawberry Creme Easter Eggs – It’s not always easy to find healthy chocolate treats for our children or grandchildren at Easter time. 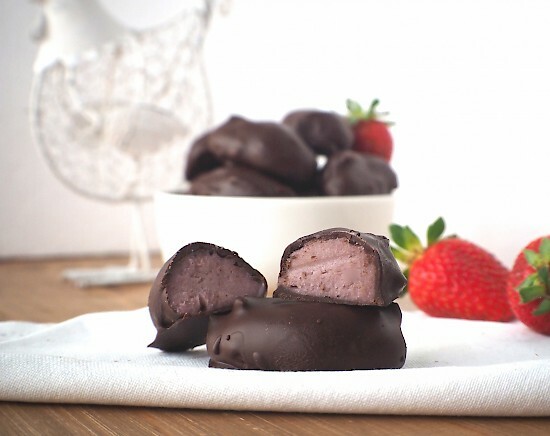 The delicious strawberry filling in these Chocolate Strawberry Creme Eggs will delight their taste buds and I’m sure yours too! One of my grandson’s favourites. 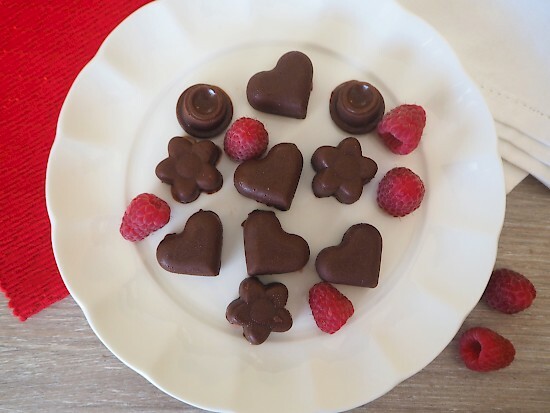 Raspberry Chocolates – Smooth and creamy chocolates filled with fresh raspberries. 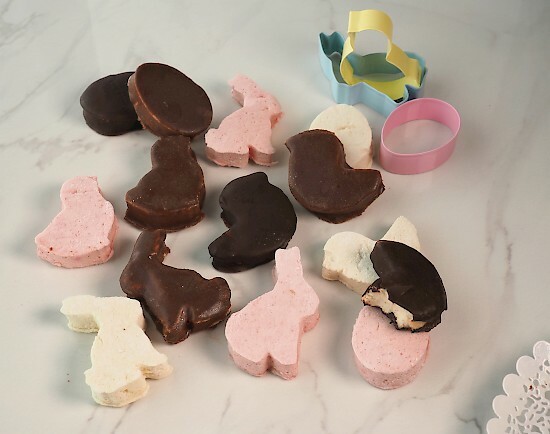 These delicious delicate chocolates can be used as an Easter gift for your sweetheart or served as a light dessert for guests over the holidays. 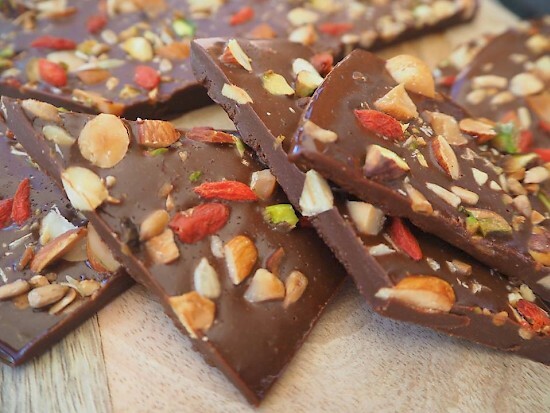 Chocolate Bark – This smooth chocolate bark gets its perfect texture by using raw cacao butter and cashew butter. By adding a mixture of nuts, seeds, berries and salt, you have a nutritious, delicious and healthy snack that will replace store-bought chocolate full of soy, refined sugars and additives. 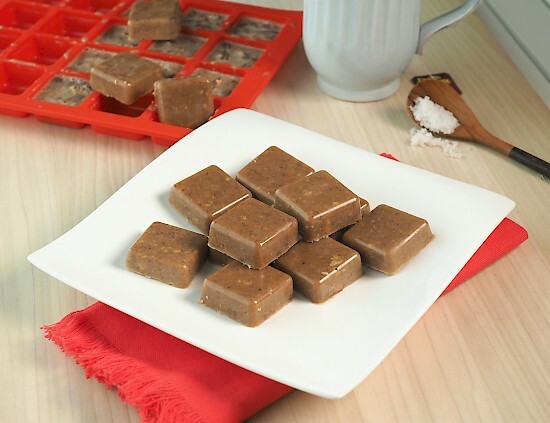 Roasted Pecan Fudge – Are you looking for something without chocolate? Look no further! Roasted pecans flavour this divine salted caramel fudge. It’s simple to make and made in minutes. It’s perfect for those that like a less sweet treat. I hope one or more of my recipes help add a little fun to your Easter celebrations this year. Have a blessed time with your family.